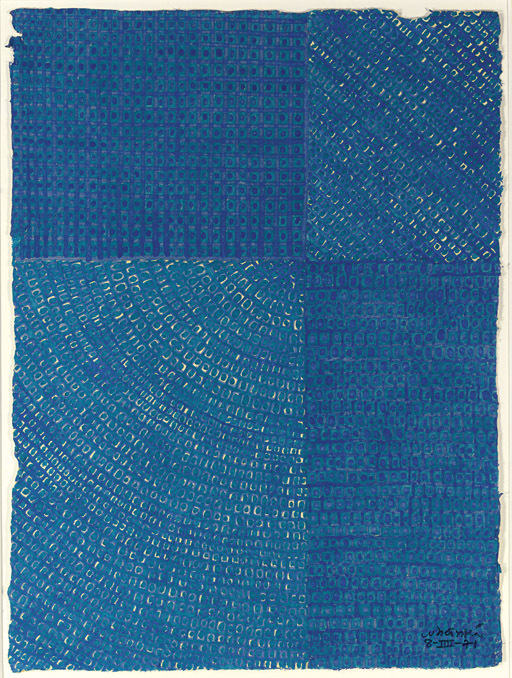 Kim Whanki is a pillar of Korean modern art. Kim's unique blend of Eastern and Western sensibilities has had timeless appeal since he started breaking new ground in the 1930s. In 1931, he moved to Japan to study European modernism, incorporating elements he admired in the paintings of Klee, Matisse and Braque with traditional Asian motifs. Gradually, Kim was drawn to abstraction, culminating in his experiments in New York in the 1960s and early 1970s. Kim synthesized the coloration of his early mentors in Paris and the formalism of the New York School in paintings that have luminosity and rhythm of their own. Kim entered the Tokyo School of Fine Arts in 1933. He had his first one-person exhibition at the Jung Ja Ok Gallery, Seoul. He was a lecturer at Seoul University from 1946 to 1948 and a professor at Hong- Ik University from 1953 to 1955 and from 1959 to 1962. While living in Paris from 1956 to 1959 he had two exhibitions in France: at M. Benezit Gallery in Paris and Muratore Gallery in Nice. When he returned to Seoul in 1959 he had one-person exhibitions at the Korean Information Center Gallery and at the Bando Gallery. In New York he had one-person exhibitions at the Asia House Gallery in 1964, the Tasca Gallery in 1966 and the Poindexter Gallery in 1971 and 1973. The National Museum of Contemporary Art, Seoul, held a restrospective of his work in 1975.